The changing faces of Pluto and its biggest moon, Charon, are highlighted in a set of newly released photos captured by NASA's New Horizons spacecraft. 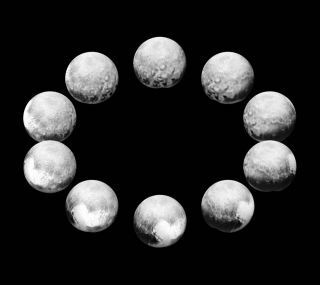 The images — captured by New Horizons' Long Range Reconnaissance Imager and its Ralph/Multispectral Visible Imaging Camera — show the famous heart-shaped feature on Pluto, dubbed Tombaugh Regio. The photos also highlight that while Pluto's two hemispheres differ radically from one another, Charon seems much the same all over, NASA officials said. Although Pluto completes one rotation every 6.4 Earth days, the time from sunrise to sunset will vary a lot as the "seasons," each of which lasts decades, pass by. Pluto's seasons are much more extreme than those on Earth, incidentally, because the dwarf planet's axis is tilted 120 degrees, compared to just 23.5 degrees for our planet. Pluto's orbit is also highly inclined. As a result, the sun would appear to circle overhead from large parts of the dwarf planet for most of its 248-year-long orbit around the sun. New Horizons took the images from distances that ranged from about 5 million miles (8 million kilometers) on July 7 to 400,000 miles (645,000 km) on July 13, NASA officials said. During the July 14 flyby, the spacecraft approached within 7,800 miles (12,550 km) of Pluto's surface. New Horizons is still beaming home images and data from the July 14 flyby, and will continue to do so through next August or so, mission team members have said. The spacecraft is currently cruising toward a small object located about 1 billion miles (1.6 billion km) beyond Pluto, called 2014 MU69, which the probe will study up close on Jan. 1, 2019, if NASA approves a potential extended mission.